SOUTH BEND, IN. 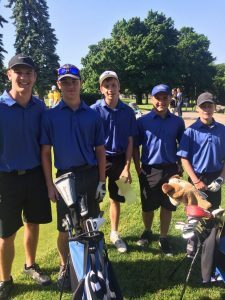 – LaVille’s Nathan Nichols-Petersen carded a sparkling 18-hole sore of 81 to become a Warsaw Regional Golf Qualifier. Petersen’s score led the Lancers and was the top individual to advance on a non-qualifying team. LaVille (401) finished ninth overall of 12 teams. Penn won the team title with a team score of 297, South Bend St. Joseph was second with 317, and South Bend Adams rounded out the top three teams to advance with a 357. Petersen will tee off at 8:20 a.m. in the Warsaw Regional Thursday June 7 at Stonehenge Golf Club. Advancing teams and individuals from East Noble, Fort Wayne Canterbury, Northridge, Peru, South Bend Riley, and Warsaw will challenge at the Warsaw Regional for the right to advance to the state finals at Prairie View Golf Club, 7000 Longest Drive, Carmel, IN 46033. The two-day state finals will be Tuesday June 12 and Wednesday June 13. Nathan Nichols-Petersen 81, Matthew Butler 98, Doug Cashen 110, Jake Anders 116, Logan Plummer 112.